If you had $45,000 and the help of an expert designer, exactly how dreamy could your kitchen be? That’s what realtor.com® set out to discover when we offered a lucky homeowner the opportunity to make over the room of their choice with our “Get This Look” Dream Room Giveaway (co-sponsored by Bankrate.com). The contest drew more than 100,000 entries from across the country, and Lillian and Kerry Lightner of Greenville, SC, were selected at random as the winners. At first blush, the Lightners’ “new traditionalist” home is lovely and functional. But there was one room that was bugging Lillian and Kerry ever since they’d moved in: the kitchen. It was just … white. White melamine cabinets, white formica countertops, white dated appliances—even white cabinet knobs. Although white can be fresh and modern in a kitchen, there wasn’t anything that felt fresh about this space. It was bland. And it certainly didn’t meet the needs of Lillian, who’s an avid cook and entertainer. That’s where I came in. As a nationally renowned interior designer responsible for hundreds of home makeovers across the country (and on TV! ), I know what it takes to transform a bland room into a dramatic yet cozy space to create inspired living. And this kitchen needed that flair—something with a touch of color, something that’s modern but with a nod to tradition, and a floor plan for maximum entertaining, storage and cooking. Kitchen remodels are never cheap. But they do provide one of the most valuable returns on investment of any home improvement project. And even if you don’t have the budget for a total makeover, you could take a few cues from what we did—changing up your lighting, adding some colorful accents, or just switching out your appliances can make things feel fresher. Yes, we spent 45 grand ($9 less, actually!). But you don’t have to. Here’s how to get the look of our dream kitchen. On the sink wall, I removed the unnecessary soffit above the sink, which made the head space feel cramped. That change would make the ceiling feel taller, and offer an opportunity for a great lighting feature directly above the sink. This combo appliance unit offered a great deal, and way more cooking power for Lillian. To make room for new appliances, we did away with the counter space on the rear wall of the kitchen (the jumbo island satisfied that need, anyway) and added a stainless-steel wall oven/microwave combo unit. These double units can be upward of $5,000, but I got an awesome combo for under $2,000 from Build.com. On the same wall, I added a new counter-depth stainless-steel french door refrigerator, which wouldn’t cramp the floor space the way the old standard-depth refrigerator did. 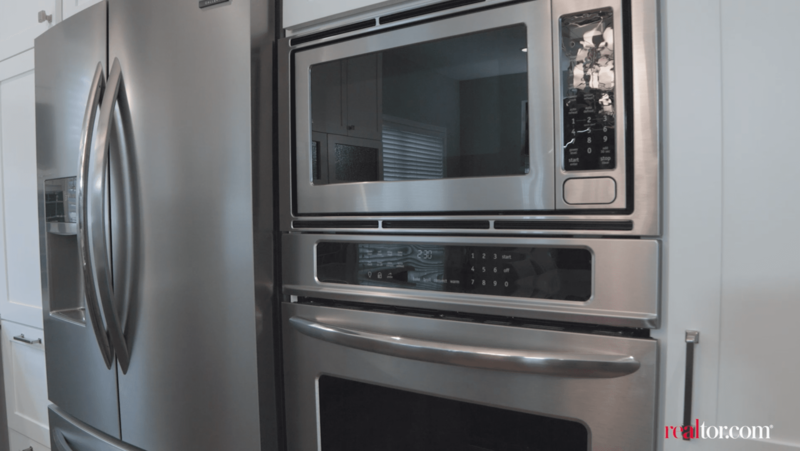 A high-end gourmet range with a built-in ventilation system can cost a small fortune, but I found a great deal on a perfect one from Kitchen Aid. And finally, we put in a new granite composite sink. Before, the cramped sink and discount faucet made cleanup a challenge. Now, the new sink offers much more space and stain resistance. Although a pro-quality faucet can easily cost over $800, I got this great one from Delta for around $200. One of the biggest changes was the cabinetry. I suggested building Shaker-style cabinetsin a two-tone finish: a bright white-painted finish on the tall and upper cabinets, then a rich gray on the base and island cabinets. I found the perfect gray paint in “Anonymous” by Behr. I also selected crown molding at the top of the cabinets and furniture feet for the base cabinets. Furniture feet are an elegant custom touch that are easy to add to existing cabinetry—and they start at only $8 each. 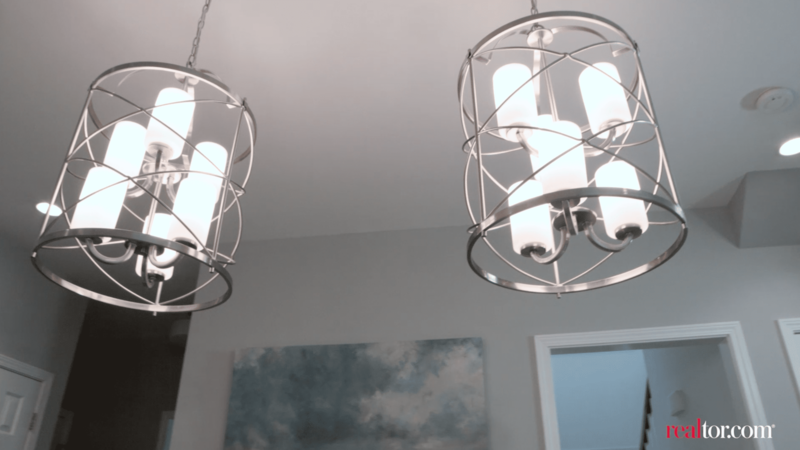 These unique chandeliers gave the room the modern elegance that the Lightners craved. New wood flooring can cost $10 to $20 per square foot installed, but sanding and re-staining the floors a rich walnut hue cost only about $1 per square foot and made the old wood look new. 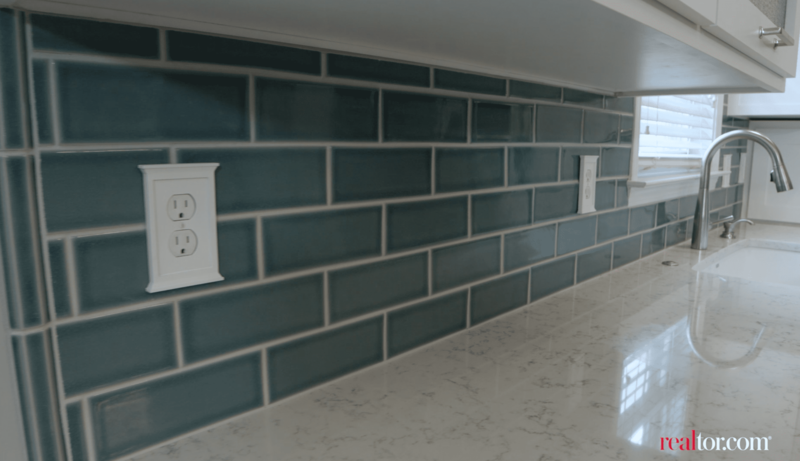 This teal backsplash provides a necessary pop of color. One of my favorite design tips is to add an unexpected pop of color to give a custom feel to a space. 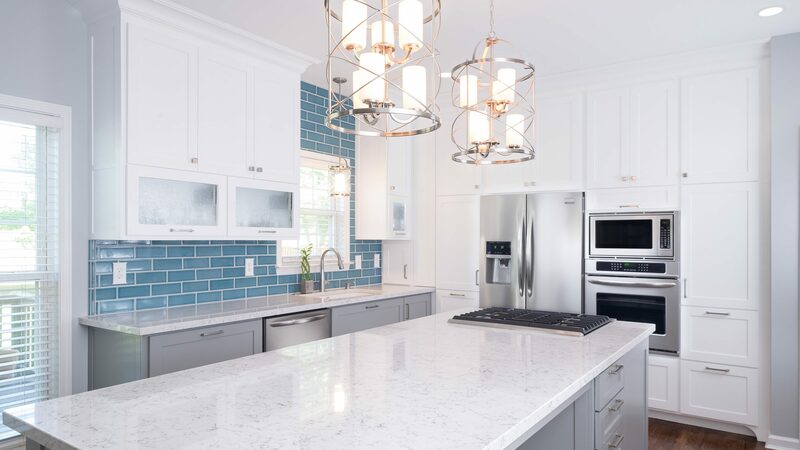 Lillian is passionate about teal—it was the color of her bridesmaids’ dresses, it’s featured in other areas of her home, and I knew it would make the perfect accent hue for her backsplash. Walker Zanger has a gorgeous peacock crackle subway tile that was just what Lillian was dreaming of. For the counters, I chose a quartz composite; it has the look of marble, but the durability and stain/heat resistance of a solid surface. A counter like Silestone’s “Lyra” is definitely one of the pricier items at around $60 per square foot installed, but worth the investment as it can last a lifetime. Of course, I didn’t do all of this alone. I enlisted the help of Daniel Jachens and his company Daniel Builders, a South Carolina construction outfit that has extensive experience with kitchen remodels. 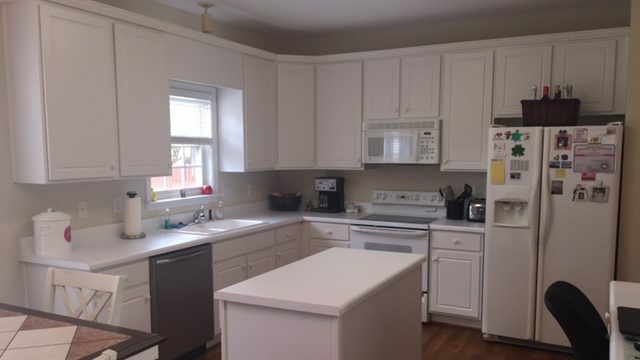 After they ripped out the old kitchen, they installed the new appliances and plumbing fixtures, and painted the walls a light silver to offset our gray and white cabinets. Construction had a few minor hiccups along the way (as all projects do), but the team stayed on time and on budget. Finally, it was time for a few finishing touches: a window bench, side table, artwork, and accessories. These pieces are vital to making a space feel complete, but they don’t have to be expensive. I found everything at Home Goods for under $400. In the end, we came in under budget, and created a dramatic but timeless look for Lillian and Kerry which they can enjoy for years to come.